Patrick has been volunteering as a Project Manager for Spinal Cord Injury BC’s Access North initiative. The initiative catalogues and showcases accessible outdoor spaces in Northern BC and around the province. 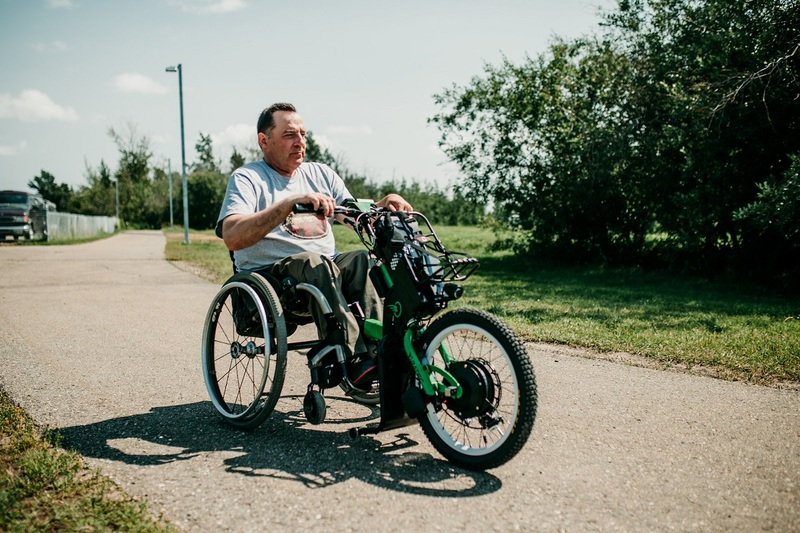 As part of his role, Patrick completes accessibility audits and makes recommendations for improving accessible amenities to parks, recreation sites, and trails. Due to a spinal cord injury, Patrick has been using a manual wheelchair for many years. Because of this, he has developed a shoulder injury and chronic pain from overuse syndrome. This meant he found it difficult to push his wheelchair to visit sites for assessments. “I wouldn’t be able to manually push along many of the trails. I’d wear out,” he says. Patrick found out about the Technology@Work program during an annual BC SCI Community Services Network meeting. The Neil Squire Society operates the Province of British Columbia’s Technology@Work program that provides people with disabilities access to assistive technologies they need for employment, often at no cost to the client. Patrick was looking for a solution that would make it easier for him to move around on the trails.